Baltimore youth raised the stakes in the struggle against police brutality on April 27 when they set off the largest urban rebellion in the recent period. Since Aug. 9, 2014, with the police killing of Michael Brown in Ferguson, Missouri, the mood of militancy and mass action has accelerated throughout the United States. In response to the demonstrations and rebellion, Maryland Republican Gov. Larry Hogan has declared a “state of emergency” announcing the deployment of National Guard troops ostensibly to restore order. A curfew between 10:00pm and 5:00am was slated to go into effect on the evening of April 28. Gov. Hogan in a press conference during the evening of April 27 in Baltimore said that he was moving his office and cabinet to the city to deal with the crisis and that he should have been called earlier by African American Mayor Stephanie Rawlings-Blake. Such a statement and move was tantamount to a state takeover of local operations involving the crisis in the city. The Gov. emphasized a militarized approach to “restoring order.” The mayor came under criticism for not taking harsh actions beginning on Sat. April 25 when the initial eruptions occurred in Camden Yards. However, the mayor was aware that if hundreds of cops were sent in to the crowds of African American youth on the afternoon of April 27 a more violent and deadly situation could have occurred. Obviously the degree of anger and discontent among African Americans has reached a fever pitch in the city. 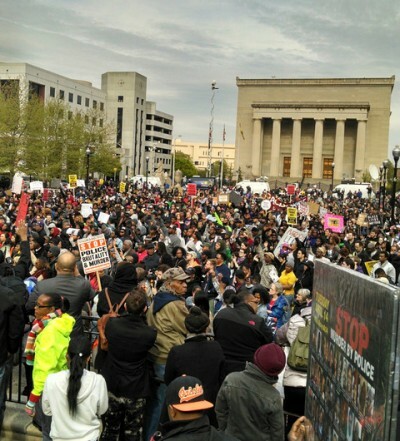 In an attempt to derail further youth protests, schools in Baltimore were closed on April 28. Federal government offices and many businesses did not open while the Baltimore Orioles baseball game was cancelled. Some 5,000 cops from throughout the region and 1,500 National Guard troops called out by Gov. Hogan were being deployed establishing a police state in the city. The use of lethal force, the launching of teargas canisters, sound grenades, LRAD and pepper spray could have created a situation where dozens may have died and suffered serious injury, many of whom would be African American youth. Such an immediate outcome from police repression of the rebellion would have broadened resistance and posed an even deeper political problem for Washington. administration of President Barack Obama. The so-called post-racial president has systematically refused to address the ongoing problems of national oppression and institutional racism in the U.S.
At a presidential press conference with Prime Minister Shinzo Abe of Japan on April 28, Obama attempted to avoid the issues surrounding African American national oppression, answering a question directed at Abe on the much-dreaded Trans Pacific Partnership (TPP) and his support for further globalization and predatory world capitalism. Later Obama said his thoughts were with both the family of Freddie Gray and the police who were injured. Obama then went on to denounce the rebellion saying there was no excuse for violence. That the mass actions of the African American youth were counter-productive and that looting was not protesting but stealing. Then the president began to enunciate trivial efforts to address the problem of police-community relations. No initiatives were discussed to provide and guarantee jobs, housing, education, healthcare, utility services, access to water and other essentials of life. The Obama administration has supported the undemocratic policies of forced removals of African Americans and the privatization of public assets. In Detroit, the administration issued a pseudo-legal rationale for the imposition of emergency management and bankruptcy that looted billions in pension funds, healthcare programs and public resources from a majority African American city. It would take the death in police detention of 25-year-old Freddie Gray leading to anti-racist demonstrations in Baltimore that would set the stage for a rapid escalation in social defiance and political consciousness. However, the death of Gray was just the spark that ignited a long-simmering fire of anger and intolerance for injustice. Baltimore has been a notorious center of police violence against the African American community. This factor is coupled with large-scale foreclosures of homes by the banks and the impending water shut-offs of tens of thousands of households in the city. A demonstration on April 25 in downtown Baltimore at the Camden Yards, illustrated the changing character of the protests and rebellions, popularly characterized as “Black Lives Matter.” These mass actions stemming from police misconduct but reflecting a much deeper level of national oppression and institutional racism have been both nonviolent and violent. On April 27 high school students left schools and began to demonstrate against the police killing of Gray. Subsequently clashes erupted between the police and the youth resulting in the smashing of windows, the pelting of police and the destruction on law-enforcement vehicles. Corporate and government media commentators seek to divide the resistance movement between those who engage in what is considered “legally protected” forms of dissent as opposed to acts of property destruction and attacks on law-enforcement. These apparent two forms of action often overlap, where it will only take provocations by the police to turn a peaceful demonstration into a mass rebellion. Blocking access to highways, major thoroughfares, shopping malls, major sports venues, entertainment and financial districts, cuts into the profit-making system. Images of African American youth throwing missiles at the cops, smashing police vehicles and liberating consumer goods from businesses, the setting of fires in strategic locations to block access by the authorities into areas that have been taken over by the those in rebellion, illustrates the growing sense of outrage not only against law-enforcement but challenging the structures of racial capitalism. Cable news television stations and their local counterparts are quick to put a spin on the events seeking to ignore the fundamental class and national oppression so prevalent in the U.S. Showing youth attacking private property is explained as criminal activity while the police are portrayed as victims of youth gangs out to commits acts of burglary and arson. At the same time highlighting scenes of people coming to clean up after the destruction of stores and police property focusing on the volunteer nature of the community and refusing to point out that the municipal administrations are absent. That the mayor’s office which calls for calm and the restoration of order is never questioned about why these same youth and their communities have been ignored for decades. No serious analysis is done by the corporate media over the nature of this so-called “progress” in Baltimore. These putative “development policies” serve to remove African American poor and working class communities while empowering a white-dominated ruling and middle class buffered by a comprador African American bureaucratic bourgeoisie which works on behalf of the banks and corporations in subservience to the law-enforcement agencies and the state government. All of sudden the people are portrayed as destroying their own communities. The communities become theirs when they rise up in rebellion but not when capital seeks to seize people’s homes and turn off their water resources. During this period when the state and corporate entities want to enforce the supremacy of the ruling class, there is generally no discussion about the people’s ownership of where they live and work. The narrative is centered on the imperative that the oppressed and working people must pay their predatory loans and inflated utility bills. Appeals for personal responsibility and parental assertion of control, only applies during the urban rebellion. Whether these same youth and adults have decent jobs and economic opportunities never enter into the discussion because the one percent has nothing to offer beyond minimum wage employment, state repression, mass incarceration and economic exploitation. financial interests to engage in large-scale removals of African Americans and other oppressed neighborhoods for the benefit of the profit system. The escalation in the liberation struggle of African Americans since last summer represents the worsening social conditions in urban areas throughout the U.S. These problems cannot be solved under the existing system of racial capitalism. Wealth created by the majority of the working class and oppressed must be distributed equitably in the U.S. in order for social peace to take hold. What we are witnessing in various cities from Ferguson to Oakland and Baltimore portends much for the rest of the country where the same issues remain unresolved since the era of Civil Rights and Black political empowerment of the 1960s and 1970s. To ensure a fundamental advancement in the national liberation movement, the youth and workers must be organized into revolutionary formations which provide the political education and long-term planning aimed at addressing the crisis at its base. It is the banks and corporations who have systematically disenfranchised and impoverished the masses of people in the U.S. Any solution to the crisis must hold the ruling interests accountable for the monumental crimes committed against the people. There should be a halt to all foreclosures and evictions in Baltimore. The water shut-offs must be immediately stopped. All youth and adults seeking meaningful employment, economic opportunities and quality education must be provided with these resources. National Guard troops and police should be withdrawn from the African American communities. The people must be empowered to both define and pursue their fundamental human, political and economic rights to peace, living wages, quality housing and schools leading to total community control and self-determination.